Whether you’re sending a card to your customers, partners or employees, taking a more personal approach to your messaging can do more for your business than just spread a little holiday happiness. Sending a card around the festive season is thoughtful and guarantees feel-good vibes, but it can also strengthen your working relationships, re-engage customers, or simply make employees feel valued. Everyone loves to receive a handwritten message, and in the digital age, a physical note shows that a little extra care that can lead to a boost for your business. Fancy spreading some festive cheer? Plan a more personalized gesture with our Greeting Card guide. A friendly message that builds relationships with stakeholders who you buy from or work with in partnership. There’s no promotional angle or sales opportunity with this type of card, so you can afford to go as jokey, playful and off-the-wall as you like. Business benefit: Builds goodwill and positivity between you and the people your business depends on. A Greeting Card that expresses thanks for their business over the previous months and makes them feel valued. It recognizes the relationship you’ve developed and expresses the hope that you’ll continue things in the same way. Business benefit: Helps you cement a positive relationship and encourage repeat business. 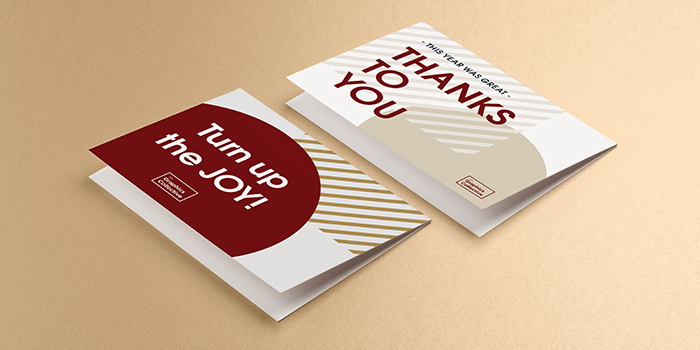 A card that recaps a successful 12 months – or even 12 years for a long-standing employee – and acknowledges the support your business has received. If applicable, it can also indicate how your business has grown in value. Business benefit: If you’re a company that has started up with investor help, or even if you’ve just receive useful advice and mentorship, it’s always worth remembering and valuing your supporters – after all, they’re the ones who believed in you from the start. This type of card is an unobtrusive way to maintain contact with someone who may have bought from you in the past but not considered your offering recently. It gently reminds them who you are and what you have to offer. While it’s not the place for a sales message, it may be helpful to include a URL or company boilerplate on the back of the card so the recipient can refresh their memory of you. Business benefit: Encourages re-engagement with your brand, and could prompt a customer to come back to you after a dormant period. A brand-led/product-led card that plays on the familiar in a fun way. You could reproduce your product logo using a festive color palette, photograph your range under a fir tree or depict a delivery truck being pulled by reindeer on a snowy road. Business benefit: Builds your brand and adds a light-hearted, fun dimension to a working relationship. We can’t help with the writer’s cramp, but our Printfinity feature means you can have a range of different designs within a single pack, so you can indulge your creativity without over-stretching your budget. Like what you see in this story, now you can get the look! Create customised Greeting Cards appropriate for any special occasion with MOO. Personalise each card with photos and words to make the receiver feel special. With Printfinity you can print a different photo or design on every Business Card, Sticker or Postcard in a pack. It’s a real conversation starter! Is your company’s onboarding process up to date?